Gandhi, who is in the UAE on a maiden visit, was accorded a warm welcome by the Indian diaspora at the Dubai airport Thursday. 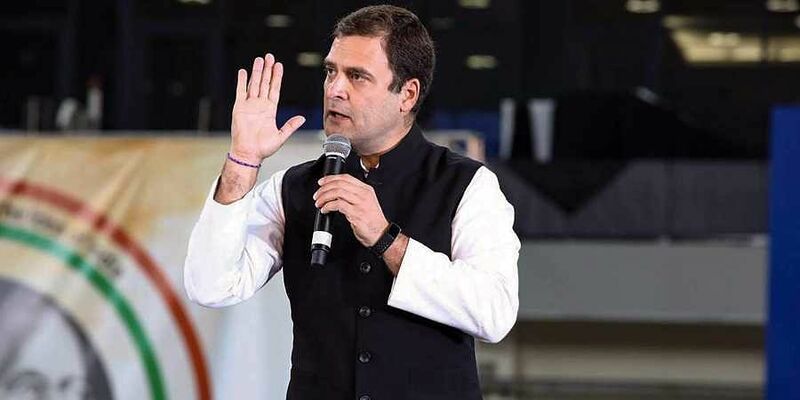 DUBAI: Taking a jibe at Prime Minister Narendra Modi, Congress President Rahul Gandhi on Friday told Indian workers here that he wants to listen to their problems instead of telling his "Mann Ki Baat". The Congress president said his party was aware of the difficulties faced by the labourers and wants to help them. "I realise you face several hardships. You work all day, send money to your family back home. We want to talk to you," Rahul said. "Main yahan apne mann ki baat kahne nahi aaya hun. Main yahan aapke mann ki baat sunane aaya hun (I have not come here to speak my mind, I have come to listen to you)," he said in his address at the Jabel Ali labour colony. He was referring to Prime Minister Modi's monthly radio broadcast 'Mann Ki Baat' where he address the nation on various issues. "All these massive developments you see here, tall buildings, large airports and metro, would not have been built without your contribution. You have given your sweat, blood and time for the development of this city and you have made Indians of all backgrounds proud." "You have illuminated the names of every religion, every state and every caste," Gandhi said while praising them. He told them that he is a common man like them and would always stand by them. "The battle has begun. And we are going to win," Gandhi said, hinting at the 2019 general elections in India. Accompanied by Kerala Congress leader Oommen Chandy and Indian Overseas Congress chairman Sam Pitroda, Gandhi was welcomed to loud cheers from the labourers gathered in the camp. Earlier, Gandhi met with the business leaders in Dubai. At his meeting with business leaders and professionals in Dubai, he interacted with prominent UAE businessmen including B R Shetty. At the beginning of the day, Gandhi and Pitroda met with business leaders at a breakfast meeting. The Congress president had a meaningful interaction with members of the Indian Business and Professional Council in Dubai, the Twitter account of the Indian National Congress said in a tweet. He also interacted with the Punjabi community in Dubai.